A backsplash, which covers the wall between the countertops and the cabinets and behind the stove and sink, gives a kitchen personality and style. Sometimes, if it’s an especially bold color or graphic design, it becomes the room’s focal point. Picking the right backsplash can be a lot of fun but with so many available choices, it can also be overwhelming. Take a look at these guidelines to get started. If the countertop is colorful or highly patterned, keep the backsplash neutral. “Something needs to stand out, and you only want one shining star,” said Flatley. You want your backsplash to compliment the countertop, not compete against it. Match the tile design to your style. For a transitional design, try a beveled subway tile that adds some architectural flair without being boring, she said. Geometric shapes like hexagons are trending in transitional kitchens too. Pick a material that makes your budget happy. 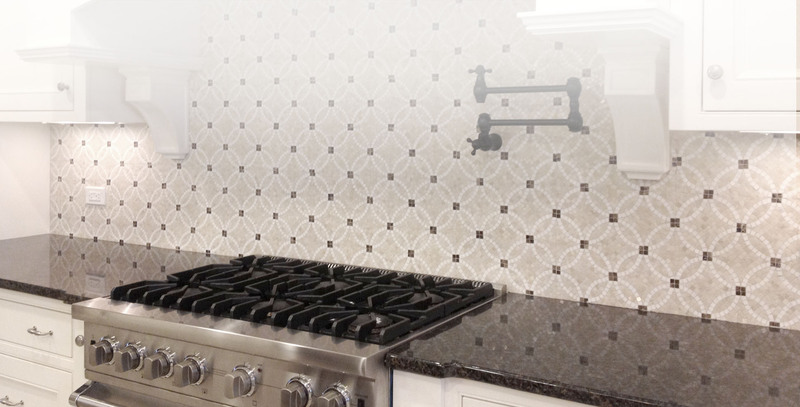 Backsplash tiles come in not just many colors, patterns, shapes and sizes but also price points. You’ll have more than enough to choose from, whether you can afford $10 or $100 per tile. Popular high-end choices include laser cut, natural stone mosaics and glass. Budget-friendly choices are ceramic and porcelain, some of which are manufactured to look like stone or wood, a welcome choice if you want a high-end custom look at a lower price. Grout, which can be as important a design element in some kitchens as the tile, comes in many colors, including black, orange and pink. But Flatley recommends that you choose a grout color closest to the color of your tile. Add a little extra to your tile purchase.